A tempting cover with the glorious qualities of watercolour for all to see and a mastery of the ever-difficult green. 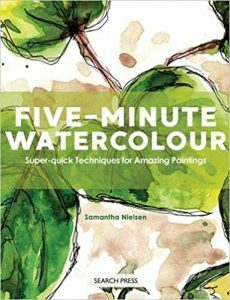 This book offers learners ‘Super-quick Techniques For Amazing Paintings’ claims the cover. Its small size belies the fact that this book contains 55 exercises to enhance your familiarity with watercolour. Practice is the key states the artist in her introduction and that is true of everything. As painters we tend to want to create a masterpiece straight away. Often with watercolour, we quickly become discouraged. It does not behave how we want it to. Will this book help? It begins with tools – you’ll find suggestions for choosing the right tools. The next chapter is about techniques. This is all about washes, blending colour, lifting colour, glazing, edges, blooms and brushwork. The book moves on to applying those techniques. I liked the pages on skies best in this section, especially the image of Pamela Harmois’ Beach Walkers, which is very inspiring. This section includes the essence of the book in that it gives five-minute chosen themes for skies, rocks, trees, water and waves, landscapes, cityscapes, seascapes, floral. These are a little lacking in instruction and are just images with a short introductory text. There are more ideas for quick ways to paint night scenes, the four seasons, people. The final section is Take it Further, which gives suggestions for improving on your new-found skills. If you wish to make watercolour part of your everyday activities, this book might well show you the way. Yet I feel it is only old techniques dressed up as something different. You might be inspired by the numerous sketches, but they are hardly finished artworks. Interesting and worth a read. Any artist will improve if he paints daily, given he understands the techniques and how to apply them.